This will be a special year for the Puddledock Press of Farmington, New Hampshire. Our Local “Good News” paper is turning 40 this year. It won’t be until December, but the Puddledock will be celebrating all year long with special Volume 40 treats and features. The Community Education Project had an Advisory Council which met monthly to plan activities and follow progress of the on-going projects. Members of the original Council were: Ann Bryant (chairperson), Jeri Tufts, Jonathan Nute, Joyce Nutter, Jim Bibbo, Joyce Mosher, Pam Lord, Jim Locke, and Earl Harding. Besides publishing the Puddledock Press, the Community Education Project also sponsored various activities which were designed to increase the community use of school facilities, such as might classes for adults and improvements to the school playground. The first edition of the Puddledock Press was issued in December of 1979, as Volume 1, Number 1. The issues in 1980 continued as Volume 1, and Volume 2 issues began in January 1981. Forty years later, Volume 40, Number 1 is on the shelves with this January 2019 issue. As part of the celebration, the Volume 40 issues of the Puddledock will feature a variety of characteristics that we saw in past issues. The public is invited to help out by volunteering and participating in some of the activities. First, we would like to feature stories from our readers about the Puddledock. If you were a past volunteer, editor, or reader, we invite you to send along any stories about the Puddledock that you would like to share with our current readers. We think our paper has historical significance and want to preserve its history in stories published this year. Second, the Volume 40 Puddledock issues will revisit some historic past characteristics, graphics, columns, and ads. We want this 40th anniversary year to honor the past decades of the Puddledock print version, while still maintaining its current quality and style. When we publish the digital version online, and in the Farmington News and Community Forum, we hope that engaged readers will comment on those nods to past issues and help us recognize the impact our paper has made on our community. 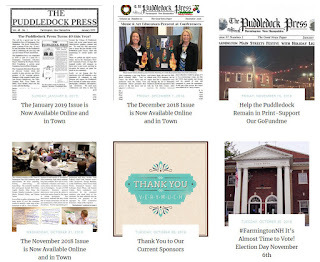 Lastly, we are hoping that this anniversary year will stimulate a new generation of volunteers to help energize and support the Puddledock Press and help us gather more articles, photographs, volunteers, subscriptions, and advertisers. We need more collaboration and ideas to keep the issues fresh and filled with the good news of our community. As we move forward through 2019, please consider helping out. Even the smallest action can make a huge difference, whether it be sending a photo and a brief description of an event you hosted, or attended; or deciding to help out with a monthly column. Our volunteer staff is limited and can’t be everywhere in town, day and night. The Puddledock Press is a record of the history of our community. It would be great is we could record as much of it as we can.